Strains of “The House of the Rising Sun” reverberated through the massive edifice. This was not a rock concert. No one was singing. The sounds came from a powerful organ played by a monk in the abbey church of Ste. Foy. The Animals 1964 hit about a brothel in New Orleans seemed a strange choice of music in this religious shrine. It was electrifying, and the perfect background for a nighttime tour of this Romanesque temple in Conques, a picture-perfect village in southwestern France. Every evening from May through September at 9:30 p.m., visitors are permitted to wander freely around the upper galleries of the church, normally off limits, to look down at the vast nave, to study the unique windows, to look up at the sculpted capitals of columns, each a magnificent work of antique art. Spot lights grow dim and then brighter, highlighting architectural details. Shadows move. The music entrances. Even for the non-religious, this is a spiritual experience, a sound and light show like no other. Conques was my favorite of the many places visited on a recent tour of the Midi-Pyrénées region in this corner of France. 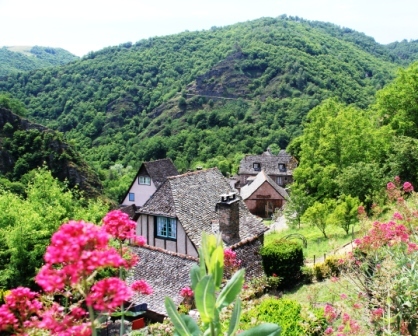 It’s easy to understand why it was named one of the “plus beaux villages de France,” (one of the most beautiful villages in France). The tiny burg of Romanesque fountains and half-timbered houses is nestled in a valley surrounded by green. The abbey church’s roots go back to the eighth century when a Benedictine monastery was established at the site in the wilderness. Relics were needed to give the new monastery clout. In the ninth century a monk set off to Agen and came back with part of the skull of Saint Foy, a Christian who had been martyred in the town in 303 AD. 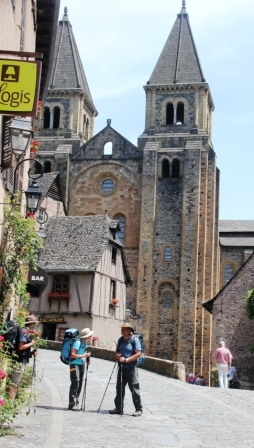 Miracles were soon attributed to the relic, and Conques became a pilgrimage site, a holy place to visit on the road to Santiago de Compostela, the well-known pilgrimage destination in northwestern Spain. 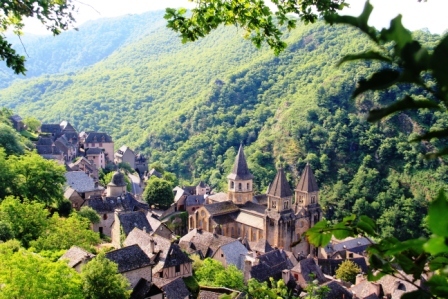 Today about 13,000 pilgrims per year visit Conques, a town with just 90 year-round residents. Most visit the Treasury as well as the church. Lavish, bejeweled gold and silver reliquaries are displayed in glass enclosed cases. The most elaborate is said to contain the foreskin of Christ. “How do you know it’s the foreskin of Christ?” asked a doubting visitor. “I don’t know. I was not present at the Circumcision,” quipped the guide. The Conques abbey Church has another attraction – windows designed by the French contemporary artist Pierre Soulages. These bear no resemblance to the usual church stained glass windows, but were designed to let light penetrate the grandiose yet somber structure. The Soulages windows, geometric shapes of glass of varying density, change color depending on the exterior light. Models of Soulages windows in the Rodez museum. 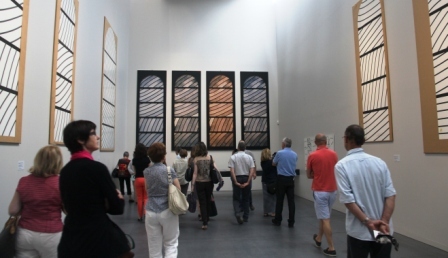 Soulages was born in 1919 in Rodez, a Midi- Pyrénées town now a must for contemporary art fans. In May, the Soulages Museum opened with some 500 works of the renowned abstract artist who is known for his devotion to the color black. 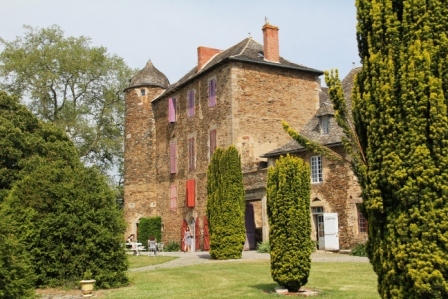 Another artist, born some 150 years ago, was the reason for a visit to Chateau du Bosc. As a young boy, the famous post-impressionist painter, Henri de Toulouse-Lautrec who hails from nearby Albi, spent summers in the chateau. Today a distant relative gives fascinating tours of the grandiose medieval house which is her home. 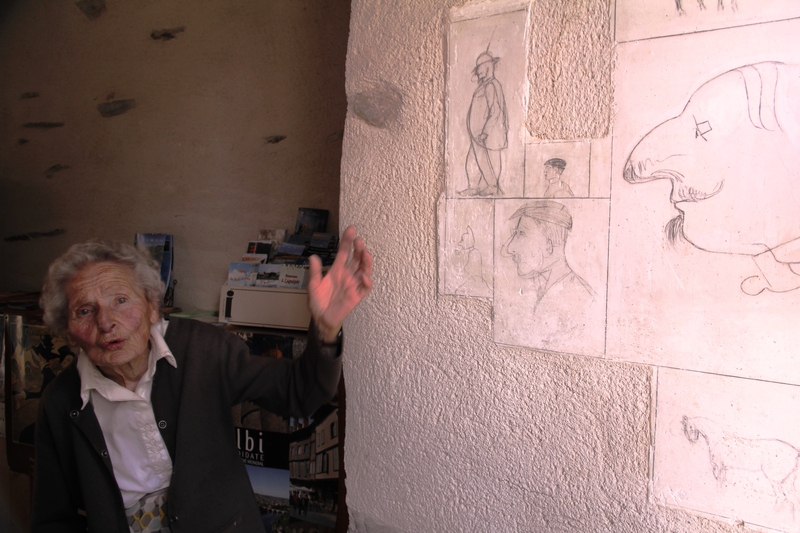 Nicole-Berangere Tapie de Celeyran, 89, tiny, frail, and slightly hunch backed, charges up the long staircases with the vitality of a teenager, visitors following behind. From the kitchen where she points out Lautrec’s sketches on the wall, she continues upstairs to a lavish salon and dining room, a bedroom, hallways, and then into the garden. “I love to talk. I want to preserve this house, the spirit of the family,” she says. She also wants to show Lautrec mementoes and correct misconceptions about the legendary artist. She embellishes the tour with stories passed on from her grandmother and other ancestors who knew the artist. Lautrec’s father and uncles often went hunting, I learned. They’d come back after an outing and relate tales of their adventures. Young Lautrec sat on the floor, using coal from the fireplace to make drawings of their exploits, she said. In his bedroom, the floor scattered with toys, she pointed out a boat Lautrec had made after his accident. At ages 13 and 14, Lautrec had two bad falls resulting in broken legs which never healed properly. He stopped growing, reaching only 4 feet 9 inches. He developed an adult size torso, but child size legs and was unable to participate in sports. He immersed himself in art instead. The chateau visit was ideal background for a visit to the Toulouse-Lautrec Museum in Albi. Lautrec’s cabaret posters have become synonymous with Paris and Montmartre, the area of Paris famous for its bohemian lifestyle and the haunt of artists, writers, and philosophers in the late 1800s. 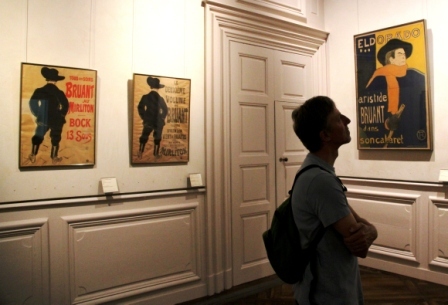 More than 1,000 of his works – paintings, lithographs, drawings, as well as the famous posters — are on display in the Albi museum which has the largest collection of his works in the world. “What is important in a painting is the person. Landscape is secondary. That was his philosophy,” a museum guide said. He painted psychological portraits, and he understood advertising, hence the posters, she explained. Lautrec was an alcoholic and died at the age of 37 due to complications of alcoholism and syphilis. 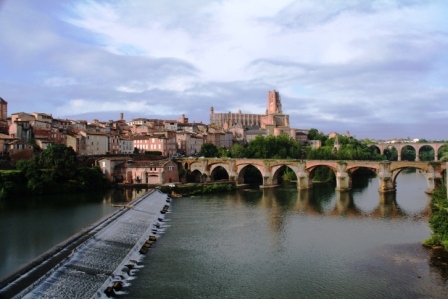 Albi, a UNESCO World Heritage site, hugs the banks of the Tarn River where it is spanned by an ancient bridge. The spires of the city’s mighty cathedral dominate the skyline for a scene almost too picture-perfect. The cathedral, Sainte Cecile, is the only cathedral in France that is still completely painted with the original 15th century paint still intact. 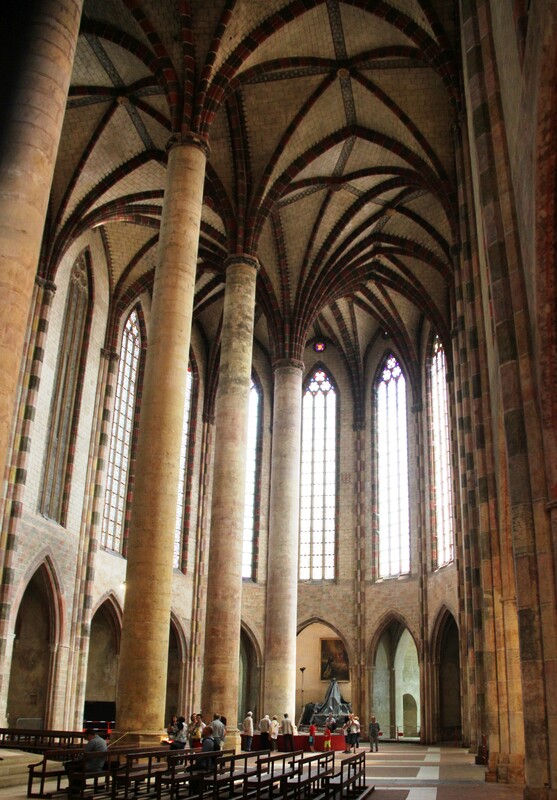 During the Middle Ages, church interiors were painted although the paint on most has long since vanished. It survived here because the cathedral is very dark. 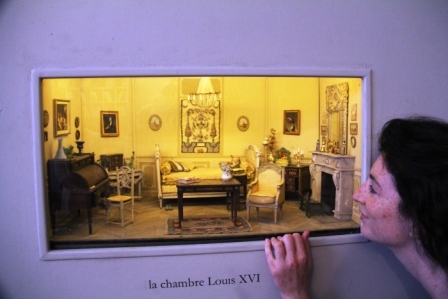 Albi’s museum of miniatures is curious if not incredible. It houses 55 miniature rooms all made by a 79-year-old woman who started the project 40 years ago. As a child she wanted a dollhouse, but she never got one. So, at the age of 39 she set out to make her own, room by room. The museum curator told us that it takes her from six months to a year to make one room. She is now busy making a miniature church. 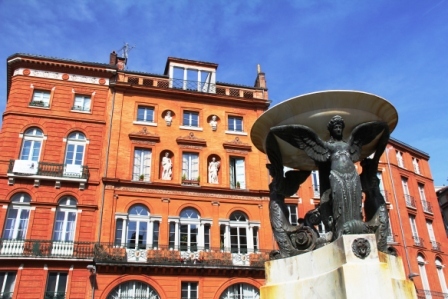 Toulouse, the capital of the Midi-Pyrénées and France’s fourth largest city, is also the European capital of aeronautics and the home of Airbus. The university city, often called the “ville rose” (pink city) due the bricks it produces which have been used in the construction of many of its buildings, is vibrant and attractive with magnificent churches, lively markets and excellent restaurants. 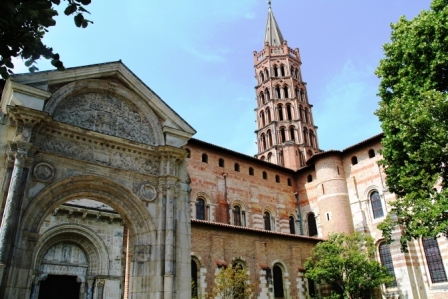 Saint Sernin Basilica, the largest complex of Romanesque buildings in the world, is listed as a UNESCO World Heritage site because it was a major stop en route to Santiago de Compostela. The Jacobin Monastery, stark on the outside, is a marvel inside with famous and unique palm tree arches. 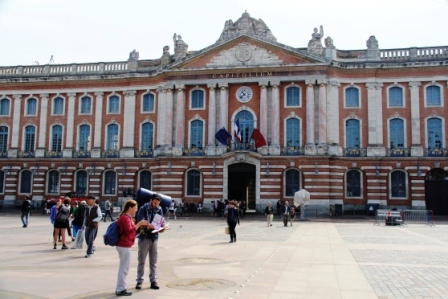 The heart of Toulouse is the Capitole, the city hall and its courtyard with a statue of Henry IV. The 18th century neo-classical façade of the elongated building dominates a large square that is always a hub of activity. Seats at one of its outdoor cafes are in demand. Thanks, Leah, for another wonderful blog and gorgeous photos…you really covered a lot of territory on that trip…we were in Albi years ago and I really liked it a lot…all the other places you covered we have yet to visit but now we have the real scoop — we’ll be much better prepared when the opportunity arises. Thanks to all for the gratifying feedback. It is another wonderful part of France well worth discovering. So much of interest to me in this post! I love bustling Toulouse (or at least I did in the ’80’s, when I lived in Pau) and also Albi, with its massive brick cathedral built to convey the power of the “true” Catholic church as opposed to the Albigensian “heresy”)… and had visited Conques briefly in the early 80’s, when it was a little known gem along the St. Jacques de Compostelle pilgrimage route (and very hard to find, I might add). Thanks to your blog, I’d love to return, especially to see the Soulages windows which were not yet created when I was there. Trouble is, all of your blogs make we want to visit and revisit magical places. “Had we but world enough, and time”! Another posting of an area of France I would like to visit. The emphasis on the Art of the region outstanding. Fabulous column! Want to be there now!!!! Loved this edition!!! We visited Albi in June so you’ve brought back many amazing memories. My favourite Toulouse Lautrec painting is the white horses head.